Project introduction: Some of you guys know us here at Vorshlag. We're a suspension design and manufacturing shop, making the world's best camber plates as well as numerous other items for various modern sports/sporty cars, such as: competition motor and transmission mounts, competition wheel studs, wheel spacers, and even our popular E36 LS1 swap kit. 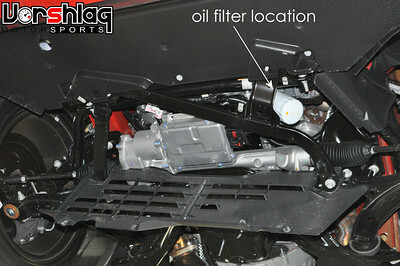 We're also an AST shock dealer and we sometimes work with AST-USA on developing new shock models and valving. We're also racers... running our test cars in SCCA Solo and NASA Time Trial, among other venues. 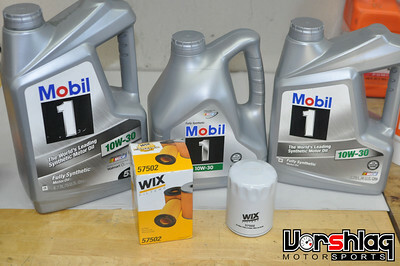 It helps us in suspension development to periodically acquire and build-up new cars. 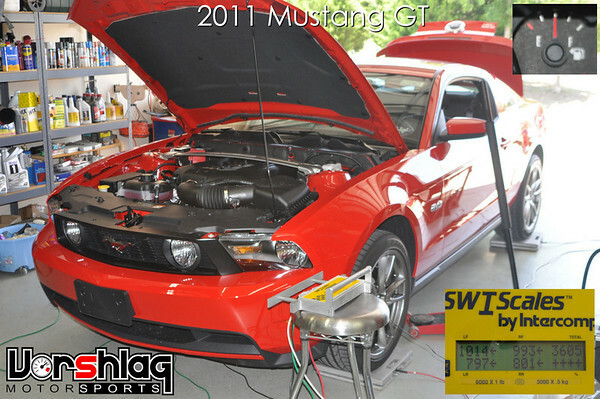 About once a year we get a few new cars in the stable, and this time we've focused on the 2011 Mustang GT 5.0. 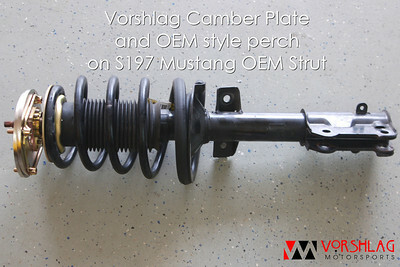 We already have 2 versions of camber/caster plates for the S197 chassis Mustang ('05-11+), but we've only sold a few of them and haven't really pushed suspension parts for this chassis yet. Its been foolish of us, because its a HUGE market (avg sales are 200K units/year) that has a large percentage of owners who are enthusiasts and that auto-x/HPDE/race these cars. I've only driven a few of these S197 cars but have personally owned and raced previous generation Mustangs (7 in total) in the past, and raced in those for many years. I was never a fan of the "mod motor" 4.6L V8 in the 1996-2004 Mustang models, however, which is the main reason I haven't owned one of these already. When GM was making their sports cars with the legendary LS1, Ford was trying to match the power with smaller displacement motors that were still massively bigger and heavier. Only the supercharged Cobras and GT500s could keep pace. 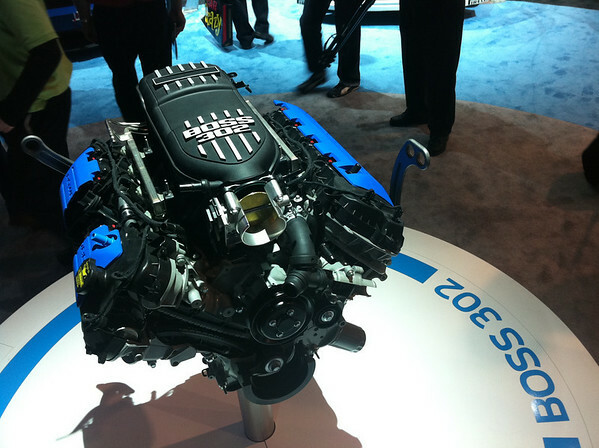 But when the all new Ford "Coyote" 5.0L DOHC V8 engine was announced in ~2007 I took notice. 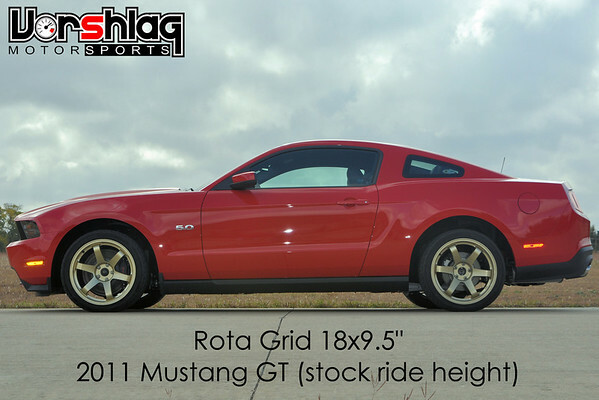 When we found out it was going to debut in the 2011 Mustang, along with an all new Getrag 6-spd transmission, we went and test drove one right after they came out in May 2010. It took about 60 seconds of driving it before I was sold... Ford had finally built a Mustang that had some serious potential and was worth comparing to cars costing 2-3 times as much! The brakes rocked, the transmission shifted better than the almighty T56 Tremec, and the motor... oh the motor was perfect. 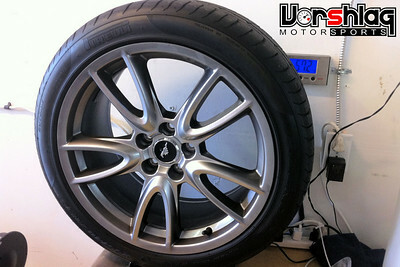 We borrowed a new 2011 "Brembo" GT for a day, took lots of measurements and weights (see below). As heavy as it is its still hundreds of pounds lighter than the other modern muscle cars - the 2010 Camaro or Challenger - and was on par with the latest BMW M3 V8, 335i and many others. Modern cars are heavy! Sure, as a 4-valve-per-cylinder V8, the Coyote 5.0 revs to 7000 rpm effortlessly, but more important: it has a LOT of low and mid-range torque, something the previous Ford 4.6L motors really lacked. 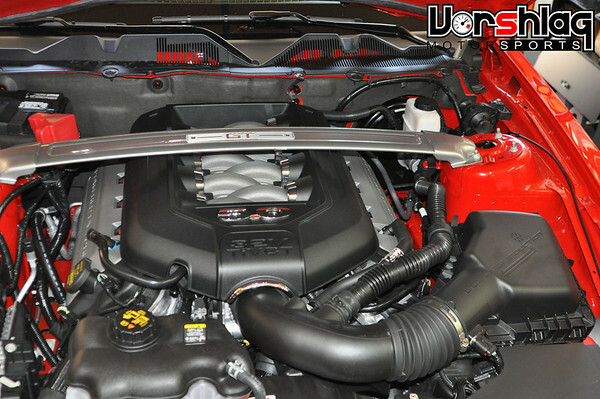 390 ft-lbs of torque and 412 hp is what these are rated at, but in reality they are making closer to 385-395 wheel horsepower, which means they have even more power at the crank than that. The power is what really sold the car for me. 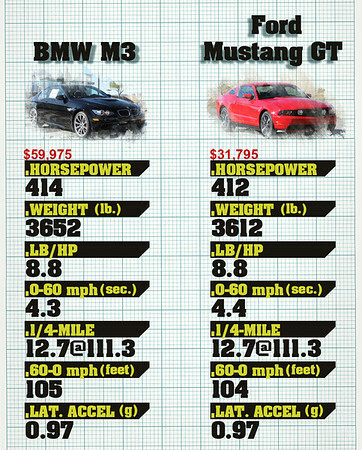 The new Mustang 5.0 was quickly matched up against some heavyweight sports cars, and the obvious E92 M3 V8 vs Mustang 5.0 magazine match-ups popped up everywhere (see spec sheet comparo above). But unlike most of the "numbers only" comparisons, the new 2011 had some serious improvements in a lot of areas (interior quality, Sync voice control, sound system/NAV, and the suspension/brakes), and was winning the hearts of most jaded auto journalists. Sure, the Mustang ran blistering 12 second 1/4 mile times and did 0-60 mph in the low 4 second range, but for once the Mustang was as quick on a road course as the $70K M3. 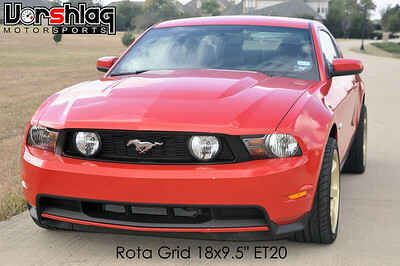 And you could get a 2011 Mustang for $29K retail, and the 14" Brembo brake package was only +$1600. So we custom ordered our 2011 GT in June of 2010. With SO many optional rear gear ratios (3), and dozens of other options, dealers were loading the cars up with crap that we didn't want. We got it with just the "standard" 3.31 rear gear (for a "longer" 2nd gear in autocross situations), the Brembo brake/suspension/wheel package, and my wife insisted on the expensive and frivolous "electronics" package (boy am I glad she did - the system is incredible). The car took over 3 months to be built, and there were further delays once it arrived, but we finally picked up the car on Oct 29th. we've been playing with wheel fitment this week... and photoshop! So far the Mustang is still bone stock, but it won't be for long. We are planning on making various parts for the car, such as revised camber plates, motor mounts, and some other bits and pieces as we run across them. 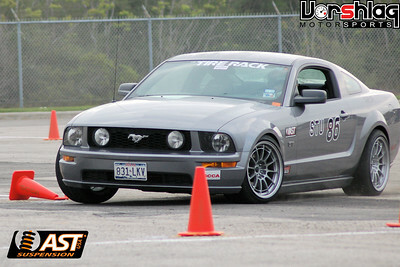 What better way to test the car than autocross and track use? So we had been planning on building it for autocross use around an as-yet-undecided autocross class, then running it in NASA TT in whatever class it fell into (the 2011 is still not classed as of this writing but it will likely fall into TTB). The obvious choice for SCCA Solo was E Street Prepared... that means virtually any suspension mods (no changing pick-up points), intake/exhaust/tuning mods, racing seats, and giant Hoosier A6 "DOT" R compounds. With the 5 time ESP National Champion in our SCCA region we wouldn't be starved for serious competition, either. But after a year of racing in another "SP" class, and trashing lots expensive Hoosier A6 tires, I had second thoughts. We had run in Street Touring classes from 2004-2009, and we kind of missed racing there. The "ST" category allows for almost the same level of mods as "SP" but uses much more cost effective tires (lower grip/longer wearing) - basically they have to be 140 of higher treadwear. Racing in this category is lots of fun and its the only category outside of "Stock" that allows you to keep your car emissions legal and still be competitive. 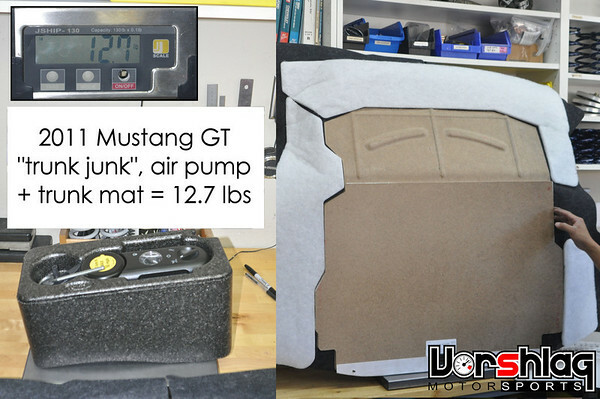 This is the weight on our '11 Brembo GT with no fuel - 3563 lbs sans 12.7 lbs of "trunk junk"
Where to run this hefty Mustang? We have seen exactly one S197 Mustang run in STU before (one of our testers - and he moved quickly to ESP), but the thought of battling against the AWD boost buggies in there in a 3600 pound Mustang, even with wider 285mm tires, would be almost pointless. Well since its under 5.1L of displacement its legal to race it in STX, as long as we stick to a maximum 265mm wide tire and 9" wide wheel. So that's where we'll start. To see if this is even a remotely competitive car we plan on doing several stages of prep and testing before spending the bucks for full out suspension and weight saving mods. Stage 1 will be fairly simple: little more than swaybars, Vorshlag camber plates, and maybe lowering springs. After we test camber plates on the otherwise stock suspension for a few weeks we'll jump right into Stage 2: AST 4100 coilovers, plates, lightweight 18x9" wheels and 265mm tires (max widths allowed in STX) - then get to an autocross! There's several Nationally competitive STX cars in our region including multiple E36 328is BMWs, several RX8s and some WRXs. Sure, we'll have double the power of the rest of the class, but the Mustang has a solid axle and LOTS of extra mass to throw around. We'll know pretty quickly if the car is going to be competitive, and if so we'll go to the 3rd stage of prep - looking for every pound we can save, and adding AST 5200GA remote reservoir (the same style AST shocks being built for Continental GRAND AM and World Challenge). That's another key area of testing we'll perform - to see how much weight we can get out of the car. 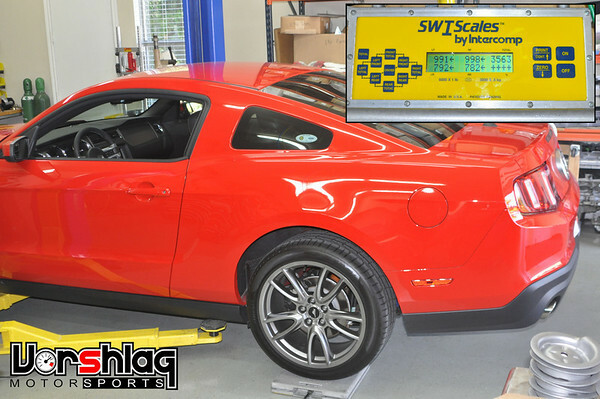 We'll weigh everything that goes on or off this car and track every pound. 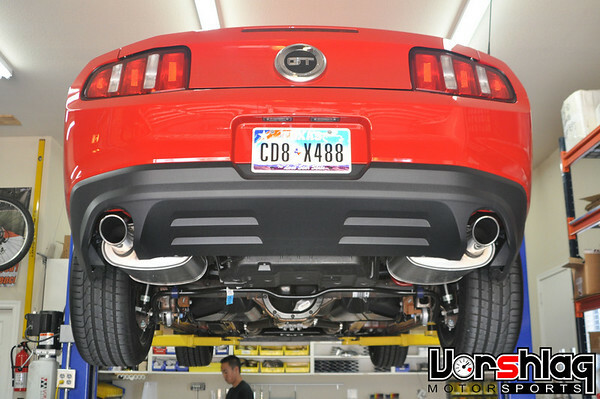 The 2011 GT gained about 100 pounds over the 2005-2010 GT, due partly to the new engine, the new 6-spd transmission, and some extra sound insulation Ford added (all S197s got the extra insulation from the GT500, in 2011, according to Ford engineers we met at the 2010 SEMA show). 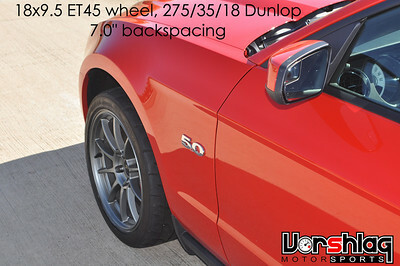 The stock 19x9" wheels and tires weigh a considerable amount also, and we're already testing lightweight wheels/tires on our car that most of the Mustang aftermarket either ignores or doesn't know about. As always we're going to post regular updates on several forums for this project, and we'll share everything we do and learn. We're all about "bringing the tech". We'll start with posts on Vorshlag forum, SCCAforums and Corner-Carvers. Please let us know of other forums we should post on! Each forum will get the same updates from us. A lot of our car projects and ideas are crowd sourced, and tapping into several thousand brains is always a help. I freely admit I'm out of touch with the Mustang chassis, and we're learning as we go, but some of you out there will obviously have more experience in these and we welcome your suggestions. One small note: Feel free to ask any questions or post helpful tips on the thread, but remember: there's potentially hundreds if not thousands of other people reading the same thread (one of our project threads from last year had 250,000 hits in 12 months). Seeing 1,000 "me too" or "cool car!" posts don't really add anything to the discussion, nor does asking the same question that's been asked and answered on that same forum thread already. Remember: if you want to subscribe to a thread you can just go to "thread tools" and click "subscribe to thread". This will keep the thread chock full of useful discussion and save everyone time when reading. Last edited by Fair! ; 04-07-2018 at 02:59 PM. Terry, just a thought: You have found some rims that would clear the calipers that either come in the right widths but wrong offset or vice-vice versa. Given the volume of the SN197 aftermarket (and its likely growth), I wonder if a company making one of those rims could be talked into producing some with the correct offset and the widths you want. Perhaps a retailer such as Vorshlag could commit to selling and promoting them? Just a thought. We are looking at the potential for helping design/market a new wheel to fit the S197, yes. It would have to be "significantly different" than the hundreds of other S197 fit wheels out there to be worthwhile... lighter, wider, proper hub bore/bolt circle/caliper clearance without spacers, etc. 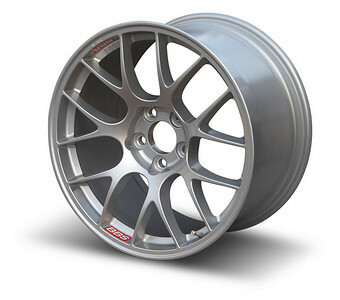 As we're seeing there are a lot of heavy wheels, and a few Nissan/Honda/Subaru/EVO wheels that can be made to fit these cars, but not any real lightweight wheels that are truly made for the S197 (other than the $637, "20 pound" BBS being sold by Rehagen Racing - see below, right). There's probably a good place to build say.... an 18x10.5" wheel (under $350 and less than 21 lbs) that would fit the S197 correctly and accept wider than 275mm tires. We'd partner with D-Force Wheels, of course. Then again, as soon as we spent the capital to make this new wheel, a company that sounds like FirePack would just copy it with a Chinese built offering and sell it for $10 less... D-Force is also getting into forged and multi-piece wheels - we'll know more about their added capabilities after the 2010 PRI show next month. 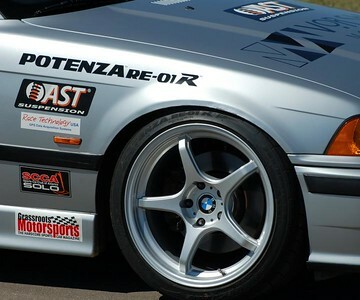 The Mustang is one car that really needs a dedicated, racer-owned/run, small wheel company like D-Force in its corner making lightweight racing wheels, and Vorshlag has worked with D-Force intensely since 2007 developing new wheel fitments for the BMW community. Let me guess......this car will not have an LSx put in? Ha! For once there is a car out there with a motor worthy enough to NOT need an LSx swap! 18X11 please! Heck, even bigger! I think it can be done, maybe with the use of a spacer in front and allow the rear to swallow the rubber. I'll put my name on the list now! Do you have plans to take advantage of any of the STX Solid-axle suspension allowances? I'm not real familiar with how they work or what advantage they'd give, but I'd think if they help offset the crappy rear end that that would be an important part of the build. 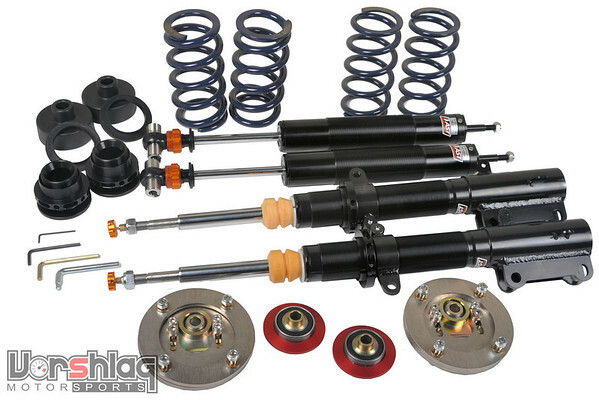 The stock rear suspension set-up looks pretty good, for a solid axle RWD car, from a basic geometry perspective. The 3 link and panhard bar are so much better than the "opposed 4 link/quadra-shock" mess that SN95/Fox3 was stuck with for nearly 3 decades. The S197 rear suspension is much more "Camaro-like" (3rd/4th gen Camaro) than Mustang-like. Not surprisingly it weighs similar to what the 4th gen Camaro did, and can fit similar wheel/tire sizes. And makes similar power. Really, the 2011 is pretty much an updated 4th gen Camaro (what GM should have built, not the 3800 pound parade float with zero visibility and IRS!). I need to read up on the solid axle allowances in ST*, but I think they are similar to SP, right? Torque arm, panhard, watts link are all allowed. If anything we'll look into the watts link. There's some other tid-bits we have planned on the rear suspension we'll talk about soon as well. Last edited by Fair! ; 11-16-2010 at 04:50 PM. Project Update for Nov 17, 2010: We've had a huge amount of responses (some that I've replied to) on the 4 forums where I have posted this thread on so far, so some of this might look familiar on the thread you're reading. Adding the RoadRaceAutoX.com forum was a big boost in ideas/questions (thanks guys). Go read that blog and see another racer who's bucking the trend in STX - by using a V8 powered RWD solid axle '67 Camaro Z/28! If you thought our build was crazy, he has pretty good reasoning for his similar-yet-different V8 RWD chassis decision there. Now his 1st gen Camaro STX build, when all is said and done, will likely be 300+ pounds lighter than our 2011 GT, so he might really be onto something. And remember: he beat all the Civics in STS back in 2006 using a RWD Nissan 240SX, so don't just assume that being competitive in STX is impossible in a powerful RWD car. He's proven that winning in unconventional cars is possible, if you develop it well enough. Very cool build, mad prop's to J-Rho! We've been tossing ideas back and forth on both of our cars, and he has clued me into some great ideas already. Also, our foray into the ST category with the S197 Mustang GT isn't unprecedented. We had a Vorshlag tester (KentK) that helped us in the development phase with our S197 camber plates and AST shocks for this chassis. Somehow Hanchey and I convinced him to try it in STU. He ran the same Enkei NT03+M 18x10.5" ET30 wheels (the rears needed more backspacing) we ran on the EVO X, and he had the STU class limit 285mm wide Dunlops, with the above mentioned AST/Vorshlag suspension. It wasn't half bad in the handful of races he ran in STU, against the Texas STU crowd here, but he didn't stick around long enough to develop it. He moved to ESP class, with big 315mm Hoosier A6 tires, where its done well Nationally - and is still doing well there. The prep level he has on the car now would have sure helped his chances in STU, way back when. 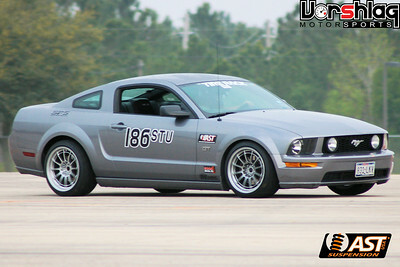 So for our 2011 GT in STX... sure, its going to take a lot of testing and prep, but we think its got an outside shot at being competitive. 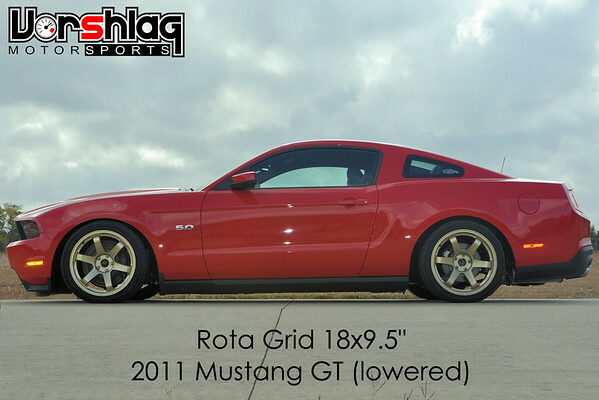 Stock for stock, the '11 GT has +100 whp over the '05-10 GT chassis Kent used in STU, too. For NASA Time Trial use (where we should have better luck using the proposed 450 whp we think we can make in STX legal trim) we'll use a wider wheel (18x10" or 18x10.5") and a wider tire (285mm) with something like 140-200 treadwear. 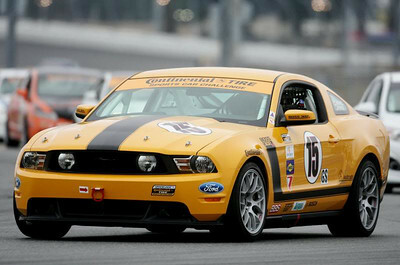 The 2011 GT was just re-classed in NASA from TTC (2005-2010 GT) to TTB (2011 GT), and has a race weight of 3770. We'll have to ballast up to make that, and it will likely end up in TTA with the mods we have planned. Ugh. We'll talk more about TT prep in a later post - we won't have a track test day even planned until after at least the "Stage 2" (AST 4100) suspension and the "big" wheels are on. Wheel Testing - this has been most of what we've done with the GT the past week, other than the initial oil change @ 250 miles (the stock oiling system takes 8 qts of oil - that's kind of encouraging, actually. Went with 10W30 Mobil1 + Wix filter). I started asking about wheel options before we bought the car, back in this massive Corner-Carvers thread about the Coyote 5.0 motor/2011 GT. 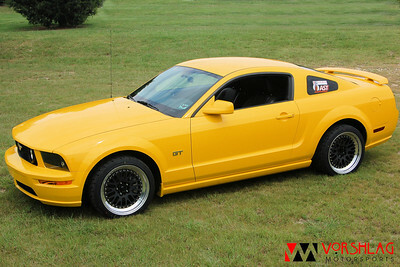 The beef I brought up there was the lack of wider, lightweight 18" wheels made for the S197. In my early measurements I could see that the standard GT's 18x8.5" and even the '11 Brembo GT's 19x9" (ET42) wheels were small for the size and weight of this car - and there was tons of room for wider wheels going inboard. The stock 19x9" wheels/tires are boat anchors (57.2 lbs per corner!) and the factory 255/40/19 tires are super tall, too (27.2" tall!). TireRack lists a bunch of heavy aftermarket stuff for these cars, too: 18x8, 18x8.5", 18x9.5" and a bunch of 19" rubbish - all of it heavy. I won't have a car that uses 19" race tires, no way. There's no reason to have 19" wheels on this car, period. 18"ers clear the brakes, and the tire choices are MUCH better in that diameter, so 18" it is. 19's is simply a styling move, and one I hate. Some of the reason we haven't found many wider 18" options yet, I think, is because the 2011 Brembo package is still "new" and the larger 14" Brembo front brakes are somewhat unknown - not all 18" wheels will clear the big caliper, as we found out. Where were the Enkeis, Team Dynamics, Volks, WedSports, OZs and the many other lightweight aftermarket wheel options?? 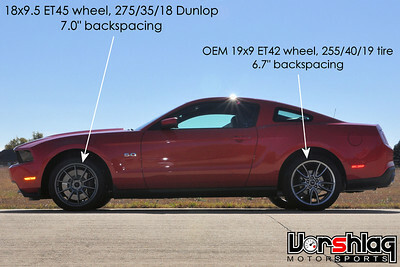 Well, digging deeper we noticed that they were all out there, just not listed under the S197 Mustang. Nissan (350Z), Mitsubishi (EVO), Subaru (WRX/STI), and Honda (S2000) all use the same 5 x 4.5" bolt circle (they call it 5 x 114.3mm). And most of the aftermarket wheels use an oversized hub bore, so we can make hub-centric adapter rings to fit the Ford's 70.5mm hub bore. That's good news. That first test was pretty enlightening. The gold wheel didn't look that bad on the car, either, but that was not the point. This Rota 18x9.5" ET20 doesn't fit inside the S197 fenders, as feared; the tire was sticking out past the fenders (about 1/2" out back - see below), but it was a good reference point and let us measure the inboard clearance to the suspension. After measuring the 18x9.5" Rota on the car it looks like we could go inboard by 2.5" in back and over 2" in front... meaning an 18x11" up front and 18x12" in back could just barely fit, if you played your offsets right. With enough camber, rolled front fender lips, and a different style front swaybar end link (more on that later). It should be easy to fit an 18x10 on both ends, though. Backspacing of 7-7.5" on the front and 7.5-8.5" on back looks to be ideal for 10"+ wide wheels, from my measurements. I then borrowed an 18x9.5" ET45 wheel (a TireRack branded Subaru-fit wheel) with a mounted Dunlop 275/35/18 tire from Paul M's '95 Impreza/STi swap project last weekend. Tested it on the GT this past Sunday and it fit much better than the same size'd wheel in ET20 we tried before (under the fenders at both ends). If I had to choose a street wheel without the need for maximum width/grip or goofy class rules that limit us to little 9" wide wheels, the 18x9.5" ET45 would be the obvious choice for the S197. 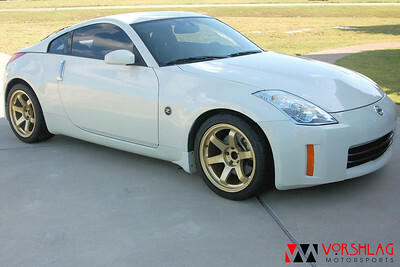 So the Subaru/Nissan 350Z fitments are what we ending up searching on, as there seemed to be many more wheel choices from companies like Enkei. Hub bore is different, but like I said, we can make a hub-centric adapter ring. I'm trying to get an 18x9" in at 18 lbs or less, so Enkei is the first obvious option we're looking at (NT03+M, RPF-1 or PF01 models). Matt found an Enkei RPF-1 in 18x9" ET35 (6.4" backspace) which might just barely fit (18.4 lbs), and they also have a PF01 (new for '09) with ET45 (6.77" backspacing) that's sub-19 lbs (the 18x8.5" shows to be "18 lbs", no weight on the 9"). 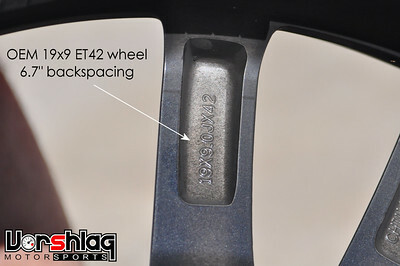 The ET45 will fit inboard better, obviously (nearly identical to the stock '11 Brembo 19x9" ET42 wheel). In the 18x10" size the choices got much slimmer... the most backspacing we could find was 7" (18x10 ET3 for this bolt pattern. So we ordered one of the 18x9" ET45 in the Enkei FP01 and one 18x10 ET38 in the Enkei RPF1 yesterday from TireRack and we'll test fit them when they show up next week and report back. We talked to the nice folks at Team Dynamics, who were willing to custom make the 5x4.5"/70.5mm hub bore in one of their 18x10 wheels in one of 3 offsets (ET40, 52 and 56 - all Porsche fitments normally in 5-130mm), all of which would fit much better ion the rear but might require a small spacer up front. Weight was the killer - 28.5 lbs for the 18x10s. Tire height is the next issue. 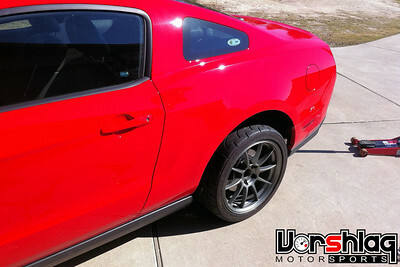 The stock Mustang 255/40/19 tires on the 19" wheels are a staggering 27.2" tall. The 265/35/18 we're thinking of using for STX class is only 25.3" tall, which is a huge difference (for gearing, CG height, etc). Not many choices there, as most of the ST-legal/competitive 265s are all this same size. For the street a closer match to stock is a 285/35/18 tire, which is 25.9" tall. Those probably will go on the 18x10" wheels for street/track use. For a variety of reasons (racer recommendations, price, compound, & sidewall style) we're looking at the Hankook RS-3 tire for initial testing. After being out of ST category for a year a lot has changed... we probably need to test the same sized tire in Yokohama AD08, Dunlop, Kumho XS, and Toyo R1R, if not more. I doubt many/any of these have been tested on a car this heavy, either. Last night I worked late on SolidWorks and revised our Vorshlag S197 camber/caster plate drawings (rev 3 for all of the main parts), so we're having a short run of these made in steel. It will eventually be released as an aluminum plate, after I have time to add the "Vorshlag" logo, model engraving, hash marks, and crunch the numbers. We'll test the plates on the stock springs/suspension next week, then try it with Eibach lowering springs (I think that's going to likely become a popular and affordable S197 package - Eibach springs and Vorshlag plates). I'll rate the stock '11 GT Brembo spring rates on our Longacre spring rater, too (see this Spring Archive for similar data). I'll stop there for now. We've got a lot more to share., and keep those suggestions, questions and ideas coming. Last edited by Fair! ; 11-17-2010 at 05:19 PM. The RX-8 uses the same 5x114.3 bolt pattern, and can fit 18x10 wheels pretty easily. SSR made a set of 18x10 or 10.5 +42 (??? i think) Comps at one point - Sipe had a set on his STU RX-8 back in the day. Last edited by altiain; 11-18-2010 at 10:35 AM. Mazda uses this same pattern, that figures. It seems all 5 lugs are this size, except GM and Porsche. Sipe has an 18x10.5" SSR, eh? Hmm... can you find out more? Size and backspacing? I don't have Sipe's contact info, and with him being in STX... don't know if he'd want to share. Not like we'll be a threat, but you know. I asked McCall what he had on his RX8... he can't remember. 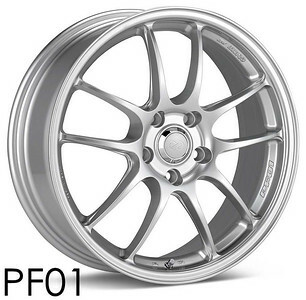 It was an RPF1 and we think it was an 18x10 or 18x9.5"? He's going to go back and see if he can find out. Talk to Wheel Dude about the Rota DPT. 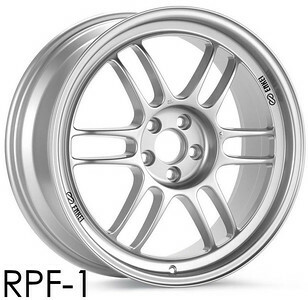 From what I've heard about the 17x9 it's only a 1-2 lbs more than a RPF1. A lot of the time attack guys were/are running them. Turn-In-Concepts was running a set of 17x9 DPTs on their car at Englishtown in 2009. They have 18x9 with 42mm and 20mm offset.